Theblogogy - Let's learn more, together. Patton Oswalt has a fun bit about Jesus' Superpowers. He points out that necromancy -- driving out demons and raising the dead -- doesn't really fit with ... multiplying food. And, yes, to my modern American ears, this is really strange. Not surprisingly, the authors of the gospels did not see that way. They included these stories (what Oswalt calls "Sandwich Joe") to show that Jesus is bringing the Kingdom of God and is not just the Messiah, but God Himself. Joel 3:17-18 says, "Then you will know that I, the LORD your God, dwell in Zion ... In that day the mountains will drip new wine..." So in John 2, when Jesus creates 160-180 gallons of wine, John is pointing to Jesus fulfilling the prophecy and that God is in Zion. When we come to the feeding of the 5,000 in Mark 6, the authors are echoing God's provision for Israel in the wilderness with manna. And the 12 baskets of leftovers signifies Christ's provision for all of Israel (a role God Himself would fulfill). The feeding of the 4,000 with only seven baskets of leftovers is in a Gentile context, showing provision for them in a similar way. Which I think is cool. Far from being random, Jesus' "superpower" to feed people was considered by the authors to signify that Jesus is the Messiah, he has brought the Kingdom of God, and is God Himself. I find Patton Oswalt very funny, but his humor reminds me that there is more to learn. Numbers 5 is a really odd passage (at least, starting in verse 11). Here we have the law concerning a jealous husband (a guy who thinks his wife has been sleeping with someone else). And while the passage reads really ... well ... awkwardly to us today -- cursing the woman, absolving the guy of guilt, priests putting dust in bowls -- further study reveals it is radically better than the culture of the day. This law protects women. The context indicates that the husband is jealous because his wife has been accused of sleeping around before, but now she's pregnant and he doesn't think the kid is his. So he takes his wife to the priest. The priest does a bunch of stuff, including having the woman hold a bowl and putting both dust from the Tabernacle floor and the ink from a written curse into it. Then, the priest has the woman drink the water while he pronounces a curse. The dust from the Tabernacle floor links the woman and her behavior to the community and the place of worship. Her actions are serious and impact more than just her and her husband. The curse is a "trial by ordeal" where God must intervene in the case. But unlike traditional trials by ordeal -- the Salem Witch Trials where the woman was guilty if she floated and was innocent if she drowned -- this one presumes the woman is innocent. Only if she is guilty will the curse come on her. What's more: The curse doesn't bring her death. Instead, it makes her miscarry and she becomes infertile (a huge blow in the Ancient Near East and any agrarian culture). This, I think, links to David and Bathsheba losing their child of unfaithfulness (see 2 Samuel 11-12). Not so among the Israelites. It didn't matter how a man felt; if his wife was innocent, he had to continue to provide for her. To us -- far removed from the original context -- this passage can sound really sexist. I was so excited to learn that it shows such a high regard for women, protecting them from the selfishness I know I can so often exhibit. 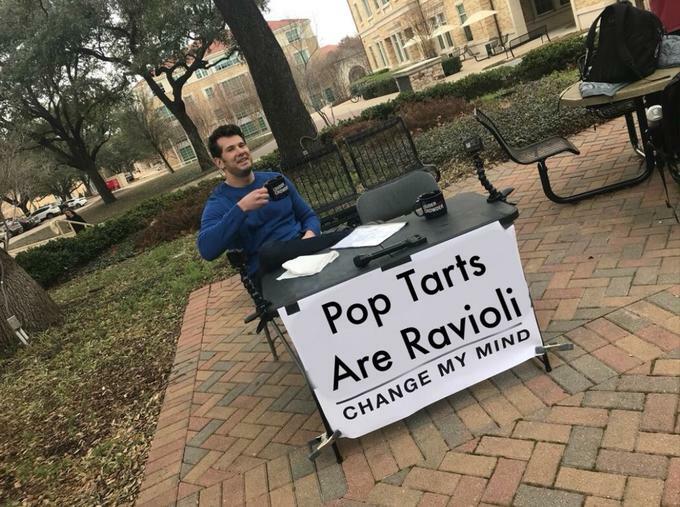 ...about whether Pop Tarts are Ravioli. I realize that I'm both late to this discussion and that this is all in good fun, but if this is how we debate something as simple as the proper terms for food, I find it not surprising that we struggle to handle discussions around much more difficult subjects like how to protect students, how to care for the environment, how best to help struggling people, as well as religious debates and whatnot. I've got several videos I'm very excited to make, but my computer keeps dying. So we both have to wait. Sorry. More to come when I'm finally back into production mode! I got to thinking about my "Adventure Bible" I used all through childhood, college, and early married life. I was at Alpha last night, and as we were discussing the Bible, one of the guys in the group asked about the "secret books" that are "hidden away in a vault". I've seen enough of History Channel shows to understand where he got this idea. But there simply isn't anything like this. You can go read the Book of Enoch right now. And if you don't have a Catholic Bible, get a copy of the Apocrypha (I have two, but I have yet to read them <cough>). Also of note: The canonization of Scripture. And then I urge you to look into the scholarship behind all this. What does my kids study Bible have to do with all this? So, I encourage you to pick up your Bible are start using those footnotes. And if you have a question, I'd love to hear it! I recently watched several documentaries about cults (such as Going Clear and Holy Hell). I've also spent many Saturdays happily talking to cult missionaries about what they believe and why. And let me tell you: If you see all religion like this, I can see why you're scared. Because cult stuff is nuts, right? People laying hands on one another imbuing power or mystical experiences. These charismatic and crazy leaders who ultimately use their power to abuse people. Kool-aid. Suppressives. Service. Secrets. And so on. This focus on rites and rituals can lead to dangerous and damaging outcomes. And here's the deal: Any religion -- including Christianity -- can become cultish. I have a friend who grew up in a pretty strict sect that threatened excommunication to anyone who left their “religion” for another brand (denomination) of Christianity. That may not quite be a cult, but that's certainly tending that way. What makes faith in Christ different? Historicity - Jesus Christ is a robust and revolutionary historical figure. Compared to Mohammed or Buddha, we know a lot about the life, death, and resurrection of Jesus of Nazareth (despite what the Jesus Seminar or Dan Brown suggest). Now, we're not typically very good students of history -- I blame the boring classes -- but when you dig in, the content on Christ is pretty remarkable. Challenge - A complaint I recently heard was that it's almost impossible to critique Christianity because there are so many different versions of it; Christians disagree about everything (not just the color of the carpeting or how long a girl's skirt should be). And that's a fair complaint. But I love what this means: We encourage questions. If something doesn't seem right, dig into it. Wrestle with it. Try to break it. ...now, does everyone in Christianity do this? Of course not! ...but that's something else to challenge, right? We're certainly not perfect, but Christians challenge one another to be more Christ-like, even as we disagree on what that means. Rebuke - When people leave a cult, the horrors come with them and a few brave individuals speak up (and are often branded as evil by the group they left). Please note: bad things happen in Christian churches, too. But here's the difference: The bad stuff is in opposition to the teachings, not part of it. Predatory Catholic priests go against what Christianity stands for. Followers of Christ should be the first to condemn such evil. Sacrificing a virgin, on the other hand, is the film icon of what it means to be a cult. The deeper you get into a cult, the more horrors you find baked in. Secrets - Many cults exhibit a form of Gnosticism, or a reliance on secret knowledge that members slowly gain or earn. The major monotheistic religions -- including Christianity -- don't do this. Instead, you are encouraged to study. You can find the questions and the answers people have had throughout history. You can read current and old versions of the Bible. You can explore the many heresies and doctrines. Thus, the historicity is regularly challenged, leaving room for us to rebuke things not in line with Christ, which leaves no secrets. There is more to explore when it comes to religion (and Christianity) compared to cults. We can certainly dig into this even further. But, for now, I want you to remember that Christianity is different from a cult in historicity, challenge, rebuke, and secrets. I'd be thrilled to hear your thoughts and what you've learned about cults and religion. The Gospel is often presented as: We're sinners. God is angry about that. Jesus took our punishment. Now, by believing He died for us and rose again, we can connect with God and go to heaven. The theological term for Jesus' sacrifice like this is "propitiation" ... or "appeasing an angry god." The related idea is "penal substitution," the concept that Jesus took our punishment. N.T. Wright argues that this idea is far more pagan than Jewish. Instead, he convincing contends that Jesus, being Israel's Messiah, must be viewed from within the Jewish context. In this light, His crucifixion isn't about absorbing God's wrath, but rather about proving purification for His people. Israel's animal sacrifices weren't about punishing the animals in place of people, but rather providing blood for purification. Jesus' sacrifice, His blood, then, provides us with purification rather than cosmic punishment. This transforms the Good News of Christianity from "Jesus took the divine bullet for you" to a message more like: Christ has defeated the evil powers that held us captive and enables us to return to our proper position as people, namely "a kingdom of priests" who exist to bring healing to a broken world and through that praise to God. Wright's book is a fascinating read even if you've never been bothered by the idea that God's justice requires Him to punish someone for sin. For me, what's more, N.T. Wright brilliantly addresses every single "issue" brought up in Mr. Deity episode 2. So go check out Mr. Deity and then pick up The Day the Revolution Began. Granted, I've only barely summarized what I see in Wright's technical argument which spans seventeen hours in the audio book version. Needless to say, there's a lot more to learn. So let's learn more, together. I've been thinking about self-driving cars and the legal/ethical issues they pose. Imagine with me that the first car was perfectly self-driving. It never had an accident. Then along came a guy like Henry Ford who wanted everyone to have the joy of driving their own car themselves. Suddenly, with humans in the mix, accidents happen everywhere. Is Henry Ford ethically/legally responsible for those deaths? He let people drive. What about the person who originally created the perfect car? Without any cars, no one would have gotten hurt by them. While lawmakers currently wrestle with these questions now that corporations and computer programmers could be blamed for accidents that lead to the deaths of children, I can't help but think of this as a theodicy: an exploration of how God relates to the problem of evil. Assuming the Bible is right, when God first created us, we were complete, without any brokenness. Then along comes Satan who convinces Adam and Eve that we really should be the ones directing our lives. And immediately problems begin for us and the whole world. These problems are everywhere today. Do we blame Satan? God? I can't wait for safe, self-driving cars. I know I don't drive well when I'm tired or angry or distracted. And I can't help but notice that this ties in really well with the call of Christianity to surrender our lives to Christ who loves us and asks us to let Him "take the driver's seat." (I've never really liked that phrase, but it's making a bit more sense now...). There is tons of scholarship on all sides of the problem of evil. I'm sure we'll talk about it more. For now, I urge you to dig into this deeper. I'd love to hear what you think and have been thinking about.